Ian Southworth is the new J/24 World Champion! Boltenhagen, 4th September 2015: The Brits did it! Ian Southworth and his crew kept their cool and sailed home an amazing start-to-finish win in the final race of the J/24 worlds in Boltenhagen, Germany. US-guy Mike Ingham, who was very close, finally had to let the prestigious trophy go to Southworth and his crew from the Solent. As on Thursday, racing was started with a Black Flag after Principal Race Officer Klaus Lahme did a general recall. Southworth, who had already suffered a Black flag disqualification on Thursday, opted for a conservative start, as he couldn´t afford to let opponent Mike Ingham get away or – or even worse – let himself get pushed over the line. Southworth and his Crew have been sailing “Il Riccio” for five years now. “It has been the longest quick campaign of our lives”, said Chris McLaughlin. “We used to race J/24 in the 80s and in the early 90ties quite successfully, so in 2005 we thought we could just step on the boat and win the J/24 World Championship in Weymouth”. The crew finished eighth – “that was very hard” – and since then has constantly been working on speed, performance and sailing skills. 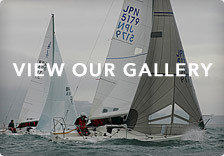 “We have virtually rebuilt Il Riccio from the keel to the mast top”, said Chris McLaughlin. At some World Championships like in Howth, Ireland, and in Cannigione, Italy, the crew was very close to the trophy, but narrowly lost in the end. Mike Ingham from Rochester, USA, who was sailing with the 2014 J/24 World Champion, Will Welles, as a tactician, couldn´t cover Ian Southworth in the last race and finished in eighth position. 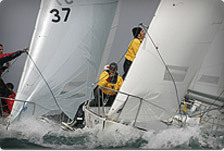 With 26 points of difference, he and his crew became vice champions of the J/24 worlds. With Travis Odenbach, The third also comes from Rochester, USA. Competition was tight for the title of the best female crew. In the end, Stefanie Köpcke and her team “Vega Ragazza” won, closely followed by Ragna Thönnessen and team “Juelssand”, with just one point separating the teams. “Vega Ragazza” have sailed a very good series this year, crowned by the title of the German Champion 2015. Javier Arribas Harten from Perú won the trophy for the best Crew under 25. Arribas Harten, by the way, is a former Bronze Medalist in the Optimist class. Best German boat is Team “Tinto” from Hamburg, helmed by Till Pomarius. Tinto, a mixed crew with an average age of less than 25, took the honours from older and more experienced crews such as team Rotoman or Süllberg. “Our next goal are the worlds 2016 in Japan”, said Genoa Trimmer Bele Schuett.